Welcome to our new domain, Nimbaterra.com! With the small fundraiser that ran between 2013-2016 we were able to raise enough for our World Package for Life AND set up a new domain and web hosting! Remember to update your bookmarks with the new address. We sincerely thank everyone who donated for helping us achieve our goals. Please enjoy your stay at Club Nimbus! Autumn has come to Nimbaterra and construction in the Sky Garden has finally resolved. Workers were kept busy all summer repairing the bridges broken by ever-shifting isles. All of the burrows remain intact but their exact locations have changed slightly. A combat arena has been added for furres who enjoy a good brawl, it can be found just southeast of the Stage Hall. Members of the Cirrus Cartel have established a meeting room in the Club somewhat close to the dungeon entrance. Cartel members can feel free to discuss their affairs in private as this meeting room is undisturbed by Bouncers and Club Workers. With Spring comes new life on the Isles and new stories to be told. For those just starting out on their journey, we have added a new section to the site called Setting the Stage for Roleplay. This should prove useful to those beginning a new adventure with us on Nimbaterra. Another useful tip is to join the Roleplay Finder list by clicking the Find RP Button below the game window. You can see other players in the dream who are roleplaying or would like to join a session somewhere. Invite some friends over for group roleplay! We love to see new faces around and try to make everyone feel welcome. If you're having trouble meeting new people, stop by the Lounge. Staff and Regulars who are not currently RPing are often found in the Lounge. Don't be shy to ask questions if you need help! Enjoy your stay and let us know what you think would help us improve! We are always open to suggestions from friendly furres. Leaves are falling all around the Sky Gardens and everyone is bundled up in scarves, hats and jackets bracing for winter's chill. Furres are gathering around the campfires to play games and tell stories. The Divine Harvest is just a month away which means Gardeners are taking extra good care of this season's crops. All of the Club's Workers are hoping that Morpheus will bless the poppies with greater potency and yield than the previous year. Two new feral friends have wandered out from the woods, the Opossum and the Ermine. These small forest dwellers are looking for a warm place to stay this winter. The Club is starting to look tempting with all its tasty treats and cozy amenities. Bartender Skye is busy putting away all of the halloween decorations and prepping to stock the bar with seasonal fare such as Peppermint Ale, Soft-Baked Sugar Cookies and Gingerbread. Blacksmiths are especially hard at work as high quality tools and weapons are in greater demand this time of year. The intense heat of the summer sun has taken its aim off the isles as a welcome cool breeze blows throughout the park and woodlands. Inside the Club, sweet treats are being served up with Punch and Witch's Brew. A couple furres have found themselves under a Bat transformation spell after drinking the Witch's Brew, so it is advised to be cautious around unfamiliar beverages. The resident Harpies have grown bold and are now being spotted inside the Club, mingling with staff and guests. Their curiosity about the establishment has now brought them closer than ever. Harpies do occasionally run into conflict with neighboring clans but affairs between the Club and Aurai Tribe have always been relatively peaceful. Harvest season has begun on the Isles. Gardeners have been especially busy with Pumpkins, which are in high demand at this time of the year. Delicious desserts, salted pumpkin seeds and various drinks can be made with Pumpkin, not to mention the tradition of carving one up for Halloween. Other furres have been busy crafting costumes for the occassion. Now that the silly antics of April Fools Day are over, The Club can take care of its recent evacuees, the Cindercove Phoenixes. Driven from their ritual ash mounds in the Cove of Cinders, these vibrant, fiery avians are working to regroup and reunite with their friends, families and loved ones. In the meantime, they can enjoy safe shelter, warm meals and good company on the beautiful Isles of Nimbaterra. Gryofalco is glad to teach any new Phoenixes the basics of furre transport. In the Bar, Bartender Skye Rufflequill and others are holding bartending classes. Spring is in full swing and the isles are lush with color and beauty. Burrowing creatures emerge from their cozy dens to greet the sun and meet new furres. Poppy harvest is off to a slow start, so Gardeners are working overtime while Alchemists extract the opium needed for various elixirs in the Clinic. Under the Areas page, some new information is available to help roleplayers get a feel for different settings in the dream. Each entry includes a brief summary of the different environments, the command to warp to each one, the different scents you may pick up in each spot and whether or not fighting is permitted. Remember, to start work you simply have to Open a Bank Account in the dream and put your chosen profession into your character's description for others to see. You may choose any job that best suits your player. Have a wonderful time, everybody! With the season of Divine Harvest over, Gardeners have been busy once more with tilling the soil and planting new seeds throughout the Sky Gardens. Naturally occuring buds and sprouts can be seen anxiously peeking through the earth. Patrons are enjoying the warmer weather that comes with the onset of Spring. Creatures big and small are slowly waking up and emerging from their burrows to partake in the more...feral festivities of Spring. Cirrus Cartel members have their hands full exporting Opium to the lower lands. Due to this, reports of violent mob-related activities are nearly nonexistent at this time. A mysterious new brew has appeared at the main Bar and Patrons seem to be enjoying it. Slave sales are on the rise and, with income at an annual high, the Club has more funding for structural upgrades and equipment. What new additions will result from this are still up for debate. New Recruits to the Flight Team mean more frequent training and flight classes for aspiring transport Gryphons. Gryofalco has been holding classes out on the Rooftop for those who are interested. Club Nimbus is celebrating its tenth anniversary. The attitude inside the bar is joyful and celebratory. Free Celebration Cake is being offered at the bar. The cake comes with balloons you can carry around the dream. Sasha Startalon in the dungeon is offering a whole keg of beer for any unwanted opium you may have accumulated. It's the time of year for apprentice wyrm invaders. They must not be allowed to steal the Orb of Infinity. Harsh winds have been knocking gryphon eggs from their nests. Maybe you can help return them? In other news, Ferians and their friends can call the Sky Garden their home with the addition of Home Burrows. These can be scent marked and decorated. There is currently no claim on any burrows, so pick whichever one you like and have fun! Club Nimbus is a fantasy/steampunk dream where avians rule the roost. Tacoma began work on the dream in August 2004. It went live again in the summer of 2006 and was revamped with fully custom patches in 2012. In 2014, Lunati and Elwood Flickertail pitched in to get us a Dream Package for life. Club Nimbus is continually being upgraded with more areas, avatars and mechanics. There's something for everyone here, including many RP areas with different themes. We have a Stage Area, Opium Den, Ballroom, Dungeon, Chapel, Sky Gardens, Rooftop, Blacksmith's Forge, Dining Hall, Medical Clinic, Library, Bath House and much more. Vending machines in the basement dispense over 50 different items including pillows, plushes, enchanted objects and more! Sky Gardens span across the floating isles of Nimbaterra, connected by bridge. Our bar has an interactive bartender, Skye Rufflequill. Skye has his own personality, greets passersby and amuses himself between work. An additional non-staff Bar is located at the Stage Area where anyone can serve. The stage bar is a perfect spot for novice Bartenders to learn the ropes. Club Nimbus has over 100 custom portraits made for various species in our dream. 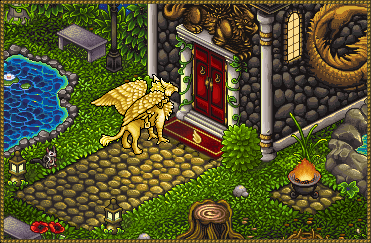 Some of our local species include Cloud Wyrms, Saddled Gryphons, Pygmy Gryffes, Werewolves, Feral Bugges and more! We are a strict roleplay guild, but nobody is required to RP in the dream. There are plenty of OOC and private areas, so all are welcome. We're still looking for more furres for RP or just hanging out. We have an advanced currency system which means you don't need to apply for a job anymore. Simply create a bank account and specify your line of work to earn pay. Furres will recieve a daily paycheck consisting of Gold or Opium depending on their chosen profession. Gold can be used to buy premium drinks at the bar. These drinks give unique auras and effects when you buy them. You can find active roleplayers in the dream by clicking the "Find RP" button or *JoinRP command. Need a lift to Club Nimbus? Type `join CN for an auto summon!